Costco Wholesale is the second largest retailer in US with the annual net sales of 102.8 billion, and it is the number 1 membership warehouse club in USA. That means Costco products are only available to their members. The membership is purchased in order to buy cheap products from Costco and this membership may cost 50 to 60 USD. However, all the Costco members think their membership is worth the cost, since they have chances to much cheaper products and actually save by so doing. Costco tries their best to offer products at lowest possible prices for members. They get products from manufacture at very high volume and asks for lowest prices from the sellers. Then Costco resells these products to their members by adding quite a limited profits. This is why Costco members think they are enjoying the lowest price that any other retailer cannot offer! Costco's promise to their members is "Keep the costs down and pass the savings on to members". Costco has tremendous buying power, thus almost all manufacturers would like to cooperate with Costco. Thus Costco's suppliers are from all fields, and you can find electronics, computers, clothing, jewelry and all you need for your daily life. Some of them are brand-name merchadise while others come under its brand of Kirkland Signature! In one world,l Costco has all for everyone. 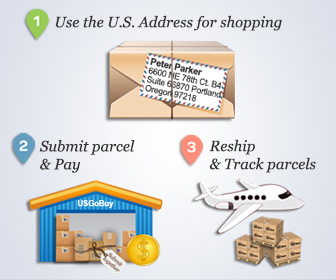 How USGoBuy International Forwarding Service Enables Your International Shopping at Costco? It does not matter if Costco membership is only limited with US residents, USGoBuy can help you buy from Costco and then ship outside to your international destination. All you need to do is simply register with USGoBuy, and then tell us what you would like to buy from Costco online store. USGoBuy would then buy for you from Costco accordingly. The final step is to pay for the international shipping cost to your country and you will have it right at your doorstep. Costco Coupons to save more! Sounds easy, right? Click the picture below to start your saving shopping at Costco now!